Card counting strategy is the most popular and checked one for playing and beating blackjack, and it consists of many various systems which really work though differ a bit. 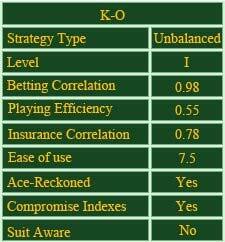 The KO count is one of such systems and it is called to be the unbalanced one. A balanced counting system: when a player starts counting from 0 and s/he should end up counting with 0 too after all cards are dealt from a shoe. An unbalanced counting system: the end is not necessary to be 0. As well as Hi-Opt 1 or Hi-Opt 2, the KO count (Knock Out counting) is easy to learn and remember: the main point is to know when to add or subtract 1 point from 0 and what should be received at the end for winning. As it has been already said above, the final number of point to get when using the KO count should not be 0. Seven cards are valued as +1 here, so you should have 4 points at the end of a shoe. Remember, that low cards are good for a player because when a low card appears it means that more high cards are left in a shoe and a player has more chances to get them; so, a player adds 1 point to 0 every time when a low card is dealt from a shoe. Big cards are good for a dealer, so, you should subtract 1 every time when a high card is dealt from a shoe. Do not forget to divide your count into the number of decks blackjack game is played. For example, if you play by 8 decks of cards and your final count after using the KO count is +8, your final result will be just +1 because you should divide your 8 points into 8 decks. The KO counting strategy is easy to understand and learn, so, even a newcomer is welcome to use this counting system. Moreover, this system does not differ a lot from Hi-Lo counting which is also considered to be one of the widely used and easy systems for understanding. Thanks to modern technologies, blackjack online becomes more and more popular today; every gambler has a chance to check himself playing this game both for free and real money. Here you'll find all main aspects of blackjack basics and land games a player should know to play blackjack. Rules, strategies, interesting facts, the latest news concerning blackjack and its popular variations. Play at the best website http://slotusclub.com/slot-machines!